Search EngineÂ Marketing is now an indispensable tool for all Businesses globally. If you do not rank in top 10 (or for that matter top 3-4) positions for your product or keyword, in most cases your business will be left behind. No doubt SEO (Search Engine Optimization) companies are cropping up like never before. And the importance is not limited to online businesses, but is equally important for brick and mortar consumer goods companies too. Millions of people make their product buying (even if you are going to do a offline store purchase) decision based on the information they find on the web. Infact, popularity of ‘using search to find information’ on the web now is the most popular activity on the web, even more than Email. If your product does not rank well in the search engines, it is missing out on bulk of potential customers. Have a look at recent figures released by Comscore on Internet searches to make product buying decision. As part of the study, comScore conducted a survey to determine the attitudes of visitors toÂ Consumer Product Goods (CPG)Â Web sites, dividing respondents into two segments: those who use search to find these sites and those who do not. The survey revealed that searchers were significantly more involved in obtaining information and demonstrated higher category engagement than non-searchers. Specifically, 73 percent of searchers were motivated by product research, 64 percent were seeking help with the purchase decision, 47 percent were looking for promotions and just 29 percent were specifically looking for the company website. Conversely, non-searchers’ top motivation was to obtain information on promotions (59 percent), to conduct product research (58 percent) or to obtain help with their purchase decision (44 percent). With Internet penetration growing in India and most of the cash rich young Indian consumers using Internet as the main tool for researching a product and making decision, search engine marketing is becoming an important and integral part of marketing plan. 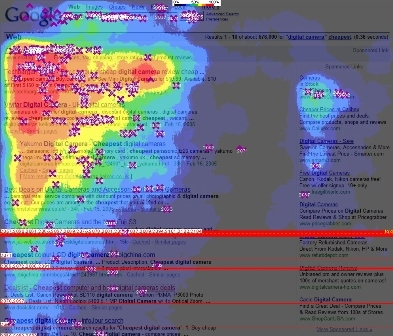 Here is an interesting graphic showing the user click heatmap on search engines. This clearly shows the drastic difference in number of clicks for top ranked results. Now Surf Web Without Internet – See, How it Works!